I came across this recipe on the Betty Crocker website and thought it looked pretty tasty, so I made it up a few nights ago. It was a wonderful, rich, filling soup with a little kick of spice that tasted great on a cool autumn night! I made a batch of cheddar onion bread in my bread maker to top off the meal, yum! Remove excess fat from chicken. In 3 1/2- to 4-quart slow cooker, mix onion, garlic, broth, cumin, oregano, salt and pepper sauce. Add chicken. Cover and cook on Low heat setting 4 to 5 hours. Remove chicken from slow cooker. Use 2 forks to remove bones and shred chicken into pieces. Discard bones; return chicken to slow cooker. Stir in beans, corn, lime juice and cilantro. Cover; cook on Low heat setting 15 to 20 minutes or until beans and corn are hot. 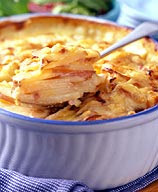 I found this recipe on the Weight Watchers website and I was BLOWN AWAY by how amazing these potatoes are, so yummy!!! By far the BEST au gratin potatoes I have ever made. I served them with these delicious apple and Gouda cheese chicken sausages from Costco. They are pre-cooked so you only have to reheat them. The potatoes are 3 points a serving and the sausage is another 3 points, so 6 points for the whole dinner! Jarom is already asking when we can have that for dinner again!